We’d love your help. 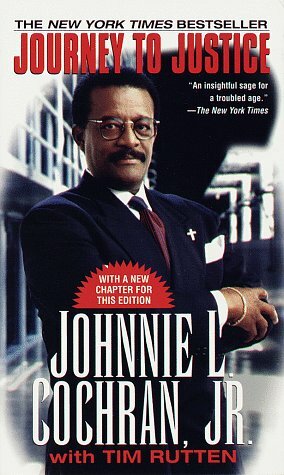 Let us know what’s wrong with this preview of Journey to Justice by Johnnie Cochran. To ask other readers questions about Journey to Justice, please sign up. The life of Johnnie Cochran & his fight from discrimination & justice for everyone. He was very religious,very close to his family & very charitable. Johnnie won the two most prestigious awards given to lawyers & was the first African American to become the number three deputy district attorney in Los Angeles. Great book! Also an eye opener! Enjoyable insight into the live of the head attorney of the O.J. Simpson, trial of the century. Johnnie brushed me up on the word "fortitude" and what it really means to women and people of color. So worth re-visiting. His perspective on it was thought inspiring and moving. After this point in the book he had my full attention. It was interesting to learn that the FBI has "black informants" / field agents in the inner cities of Los Angeles. Do black spys in black communities count as a form of black on black crime I wonder? Johnnie lived during a time when homosexuality was still kept in th Johnnie brushed me up on the word "fortitude" and what it really means to women and people of color. So worth re-visiting. His perspective on it was thought inspiring and moving. After this point in the book he had my full attention. It was interesting to learn that the FBI has "black informants" / field agents in the inner cities of Los Angeles. Do black spys in black communities count as a form of black on black crime I wonder? Johnnie lived during a time when homosexuality was still kept in the closet-several professional men lived double lives for this reason to my surprise and disappointment. It just hurts to read about the fake marriages as a woman. Poor ladies in the eighties . . . they really had to be prudent. Johnnie defines his turning point/ life lesson as one requiring a man to be tougher, skeptical and brave in the pursuit of truth. He even quotes Dr. King, "If you don't stand for something, you'll fall for anything." Chapter 7: Jonah and the Whale might as well have been my story. Johnnie pulled words right out of my heart and mind in this chapter. At this point in his memoir, I am Johnnie Cochran. He was able to decide his purpose . . . . a powerful stand to take in this life if you ask me . . . powerful. He quotes Frederick Douglas, "The struggle may be a moral one; or it may be a physical one; or it maybe both moral and physical; but it must be a struggle." I sit up and scream at the words on the page. Johnnie Cochran is a man I would have loved to meet, flatter and smell. Powerful mindset. He concludes that power concedes nothing without a demand, it never has and never will. As the memoir continues Johnnie admits that like me he did the "heart thing and not the smart thing" when it came to people and that God was the mystery behind his strength, relationships and ability to keep promises. He describes how we all have days in life that are like bookmarks-dividing what happened before from what happened thereafter. As he gets into the Simpson trail every page is a "Look at God!!" squeal of praise or a nail biting "Aahhh!! Uh uh no, no, noooo!!! oh ok, ok" moment with many reminders to self- "deep breaths . . . deep breaths. . ."
I was in middle school when the verdict came out-I now know why it was such a heart thumping story still making money today. David and Goliath is like the first story you learn in church school and thanks to Johnnie one of the most uniquely interpreted biblical stories for our times. Davids and Goliaths are part of our everyday lives if we have the wisdom to see and patience to wait out trials. After reading this book I was convinced-no lie can live forever. Johnnie has been dead for over 10 years now. I am thankful to my father who shared this book with me for Christmas holiday reading. It was worth every moment.